Last year, when I wrote about my 9/11 experience here, I mentioned how — adding minor insult to major injury — Bumpe the cow disappeared from my abandoned office at Lehman Brothers. Let’s take a moment to reflect on the type of person who loots a stuffed cow (as well as laptops, loose change and fancy pens) from a disaster area. That person must be related to the people who pick pockets at Auschwitz. But the cow-rustler is worse in a way. Because what did s/he do with that cow? Take it home to the children? “Here, children, play with this delightful cow that is covered with asbestos and cremains.” I wonder if somewhere there is an eight-year-old kid with a hacking cough who has been sleeping with his/her favorite cow for the past seven years. That would really be a case of the sins of the parent being visited upon the child. I’m bringing this up because something wonderful happened. Bumpe’s creator, Christopher Carlson, stumbled upon my old post and sent me a new Bumpe. 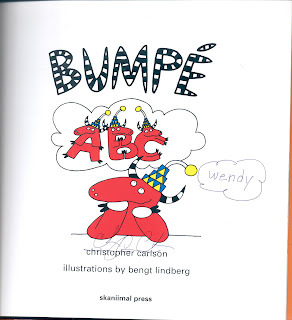 He also autographed an alphabet book starring Bumpe and look! Bumpe is thinking about me. I am so excited. Thank you, Christopher Carlson! While I’m thanking Christopher, I should take a moment to thank the other peeps whom I’ve met or interviewed because of this blog and who have made doing the blog worthwhile, including but not limited to Christian Francis Roth, Judaysia, Leah, La Belette Rouge, Jennifer, Megan, ENC, In Yr Fshn, Bobble Bee, Agathe of Style Bytes, Jennine, Times of Glory, Sharon Rose, Annie from Poetic & Chic, Oh Lady E, AltamiraNYC, Gala Darling, Fabulous Girl’s Boudoir, Somlynn (well, almost!) and Fernando the iHog. Back to Bumpe! It seems he is transgendered, because when I asked Christopher if Bumpe should be called a cow or a bull, the reply was, “He thinks he is a cow (I tried to explain to him the whole cow – bull thing, but he just doesn’t get it ).” I also think Bumpe must be a Surrealist, because after I told Christopher I’d be writing this post, he said, “What a delight re the blog mention!- Bumpe has been pretending to be a large brooch ever since he heard.” BWAH! WTF? I love it. New Bumpe and I pretending to be brooches together. 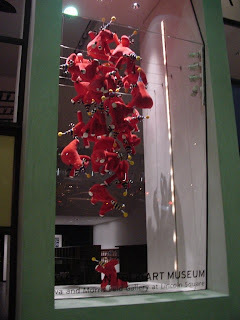 Nowadays, Bumpe is decorating the windows of the Museum of American Folk Art. How much is that Bumpe in the window? To buy your own Bumpe in person, go to the museum, Zipper Gifts in L.A., or Mxyplyzyk in New York. But the best place is online at bumpeshop.com. Christopher Carlson read about myauction and fundraising on behalf of the Nielson family and offered to send 10% of any Bumpe adoption resulting from my blog to the Nielson’s fund. So don’t steal my Bumpe! Go buy your own Bumpe and help a good cause. 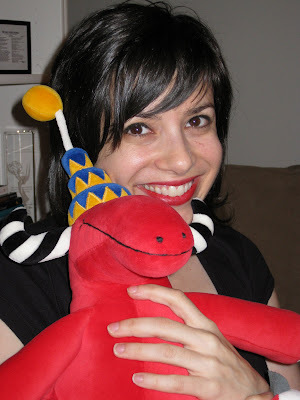 If you prefer skin care products to stuffed animals, check out gorgeous blogger Mama Fasha. She’s offering to donate her proceeds from sales of MK Skin Care for the rest of this month to the Nielsons. The latest update on NieNie, by the way, is that she had skin-grafting surgery and is still in critical condition. UPDATED 9/11/12 TO ADD: There’s a list of my other 9/11 posts here. Oh, how wonderful! Good for you, Wendy!! That’s such a great story. This is a great place for a good story I say. Bumpe is indeed very very cute. aw, i was so touched/disgusted by your story about Bumpe after reading it last week so this an even more wonderful follow up! 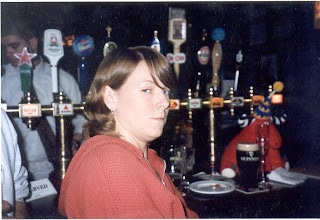 The pic with Kathy and the beer in front of Bumpe is too funny. Bumpe is a beautiful brooch and companion!! Thanks too for my mention my dear, I often think of our wonderful day out, it was the highlight of my summer-plus I have my new best friend Diana now!! What an adorable little Bumpe (and Wendy too) – what magic blogging can bring! What an amazing character! I want a Bumpe too! Excellent story! I am so happy you are reunited with your beloved Bumpe (well a bright shiny new Bumpe…but still). I’m very happy to hear you got a new Bumpe! I hope you two will be very happy together. I love how blogging brings people together. Look how many cool people you’ve met! Didn’t realize your cow was iconic (but should have suspected. . . .). Happiness to you and your new Burpee! I can’t believe anyone would steal a stuffed animal in the aftermath of 9/11. It boggles the mind. How come I keep blogging about George Clooney and he never sends me anything? Jerk. Suze, that little mail-forwarding slip I submitted to your post office took care of that. AWWW that’s so cool about your Bumpe!! That’s a great story! I want a Bumpe! I should get it for my friend who was just laid off at Lehman Brothers in NY. It’s a tragedy what’s happening in the financial industry. Dolce, I think that’s a good idea. When you give your friend his/her Bumpe, you can also pass along the regards of another ex-Lehman employee – moi! A nice turn of events. Bumpe almost matches WendyB’s lipstick. Please let me guess the moral of the story! Don’t keep your stuffed animals in your cubicle. Am I right?! Reunited and it feeeeels so goooood. I just ran outside to tell the boyfriend that I want a Bumpe, and he gave me a really strange look and muttered something about not being ready for children yet. Haha. Sweet – what a perfect replacement of the bull/cow! Ah am a sucker for happy endings. That is such a good story, it almost made me cry. I might have to get my own Bumpé. Bumpe is soooo lovely and cute!!!! And again you did a great thing for the Nielson family. we were so close weren’t we? my deepest apologies for not being able to make our date. i was so looking forward to meeting you too! p.s. she was equally sad that i didn’t get to meet THE Wendy B too. Gasp! I left a comment this a.m.and it must not have made it in. What I think I said before is that the trauma of 9/11 must have made someone desperate for a hug and they took your cow against their better angels. I just cannot believe someone in their right mind would steal at a time like that. So glad you have a new bull/cow. So sweet that he sent you one. It is an absolute highlight of my blogging life that I got to meet lovely you. Without you the She-weasel Belette would not have a He-weasel. Wow. the power of the internet. Makes me more inspired to post about “lost” alexander mcqueen dresses… Bumpe is fabulous! Also, I wanted to mention that I read Simon Doonan’s book Eccentric Glamour, and thought of you a hundred times:) (that’s meant as a compliment). Those are sooooooooooo cutee !! I’m glad ur bloggin !! A happy ending for you and Bumpe’s reincarnation. Keep telling these stories Wendy. And by the way, when I am rich I am going to commission a brooch of Sploshy, my pink starfish guy. Oh no…a cute Scandinavian bull/cow or soem greta skin care products…..both affordable! And a good cause gets money from sales? I may have to check back to this entry when my money comes in from a photoshoot! But don’t think you’re the only one who gets things from your blog. Once, I wrote about how I couldn’t find any Combos in LA, and my friend sent me like 5 bags. So, I’m kind of incredibly influential, rich, and famous, too, just with higher cholesterol and heart palpitations from eating 5 bags of Combos. I bestow upon this the 100% &$*%*$ AWESOME AWARD. All of it is just…perfect. that is so cool! i feel so honored to be in that list of celebs! i NEED a Bumpe! & your fundraising is amazing!!! my 15 year ols sons bumpe red cow accidentally got thrown away. He is devastated. I was wondering where I might be able to purchase another on. He turns 16 on June 3, 2011 and this would be the perfect gift for him. Any information would be greatly appreciated! lisaswanberg@charter.net Thank you!!! I’ll see if I can find Christopher Carlson’s email for you. Anything you could find out would be great! I’ve tried everthing and am getting nowhere. Thanks! i gave my bumpe to my nephew, and he got eaten by mice! poor bumpe. they ate his head. Oh no! The curse of the Bumpe strikes again.